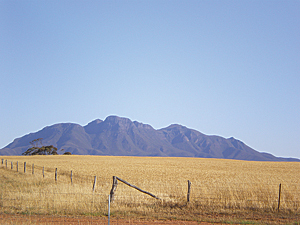 Grain production plays a dominant role in Australia's agriculture. To improve grain production, Australian agricultural researchers use GIS to understand how pests can be managed by retaining some of the native vegetation that supports pest predators. Farm production is a cornerstone of the Australian economy. Australia is one of the world's top exporters of produce and livestock with more than half of the country's agricultural output shipped abroad. Although historically wool was the backbone of the Australian agricultural industry, more recently, grain has become dominant. Wheat, barley, oats, sorghum, maize, triticale, and rice harvests are a significant part of Australia's agricultural production, whether this grain is processed for human consumption or animal fodder. Because agriculture is so important to the country, the Commonwealth Scientific and Industrial Research Organisation (CSIRO), Australia's national institution for scientific research, along with the Grains Research & Development Corporation (GRDC), conducts significant research in grain production systems. Researchers from the CSIRO's Spatial Ecology team in Brisbane investigate insect populations, conduct field surveys, and map the results. Sampling lets the team better understand the dispersal and movement of both pests and predator populations in crop and noncrop habitats. This work helps create predictive models to better understand how specific insect populations interact with their environment and subsequently develop methods to help facilitate pest suppression. "One of the problems with large-scale ecological surveys is that it's sometimes difficult to visualize spatial and temporal trends in the data," said Andrew Hulthen, GIS analyst and field researcher at CSIRO. "Geographic information system technology allows us to visualize the trends in the data we collect in a spatially explicit way, which makes it much easier for us to interpret our findings and share our results with other researchers." Hulthen recently analyzed the data collected in the field by a CSIRO-led team conducting a study to better understand how population dynamics of pest insects are affected by landscape composition. The team identified the source habitats of both pests and their natural enemies or predators, and then Hulthen used ArcGIS to examine insect movements between habitats and the length of time required for specified insects to establish crop colonization. Native vegetation can harbor many beneficial insects that eat the destructive pest species attracted to the grain in cultivated fields, so preserving the native vegetation remnants promotes an ecologically sound method of pest control. 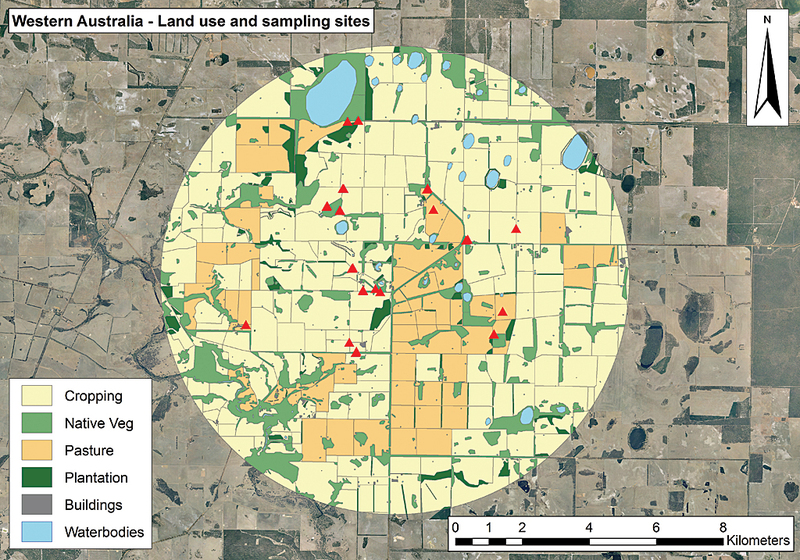 The scope of the study included monthly surveys of insect populations at more than 80 sites within six landscapes in Queensland, New South Wales, and Western Australia. The landscapes were selected based on the field crop, the distance from the field to native vegetation remnants, and the proportion of native vegetation to the area being farmed. Sampling sites in Western Australia that were sampled and mapped as part of the project. In each region, two landscapes were chosen for comparative purposes, one with a low proportion of native vegetation remnant and one with a high proportion. 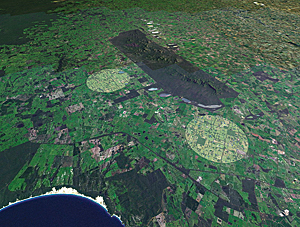 Each was 14 kilometers (8.7 miles) across and at least 20 kilometers (12.5 miles) away from the other. Within each landscape, multiple crops and native remnant sites were chosen. The study was conducted over a two-year period, and the researchers netted more than 100 insect species, 29,000 samples, and 300,000 individual specimens. The features in the selected landscapes were digitized and classified as cropland, native vegetation remnant, pasture, forest replantation, or water body. 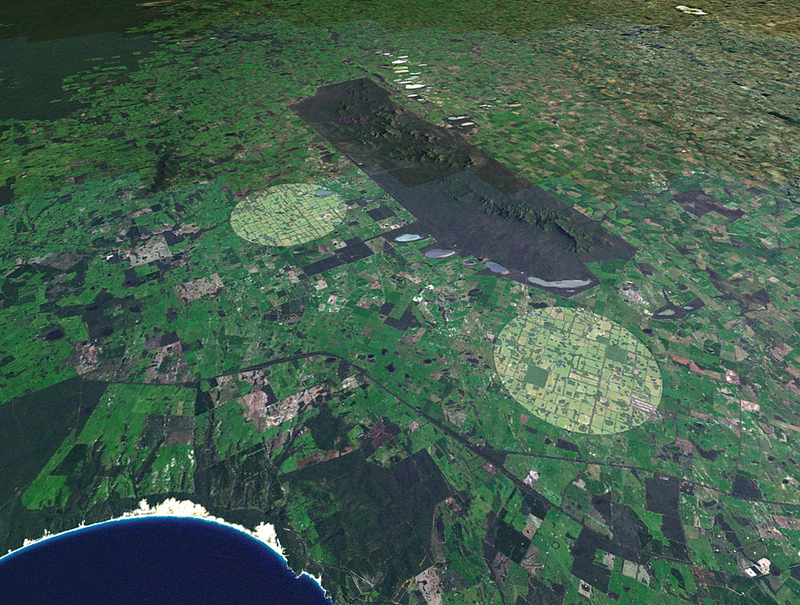 Hulthen used ArcGIS to create multiring buffers of 500, 1,000, 1,500, and 2,000 meters around each native vegetation remnant. The buffers were then intersected with the land-use feature class, as well as the data collected on the insects inhabiting the native vegetation and their travel range. Hulthen used Python scripting to automate data processing. 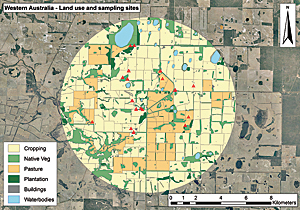 The resultant analysis provided him with maps that characterized the landscape features surrounding each survey site and helped to identify the ecosystem benefits provided by these landscape configurations. This work has led to the formulation of guidelines for planting remnant native habitat to support beneficial insect populations and control pests, thus improving grain production. "We used land-use metrics and highly detailed ecological survey data to visualize and animate insect movement in these habitats and surrounding landscapes," said Hulthen. "This allowed us to explore those landscape configurations that are less prone to insect pest attacks, which helps us develop pest-suppressive landscapes. This approach works toward reducing reliance on broad-spectrum insecticides and promotes the sustainable management of natural resources."